The Museum founders Yiorgis Markakis, University professor of Ophthalmology and author & his wife Elsa Markaki, teacher of English literature, donated their ethnographic collection to start up the Museum. 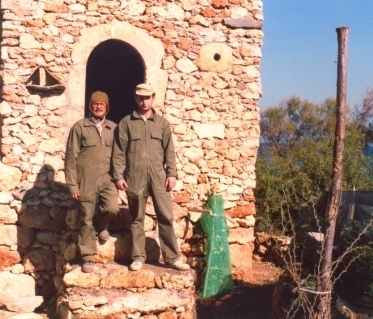 Together with their son Yiannis, and assisted by 4 local inexperienced workers they started the construction in 1986. The 2 Markakis’ daughters Ada & Tatiana also contributed in the first part of the construction, which was completed in 1991 and is presented in the short length film “Building with stones & rhymes”.